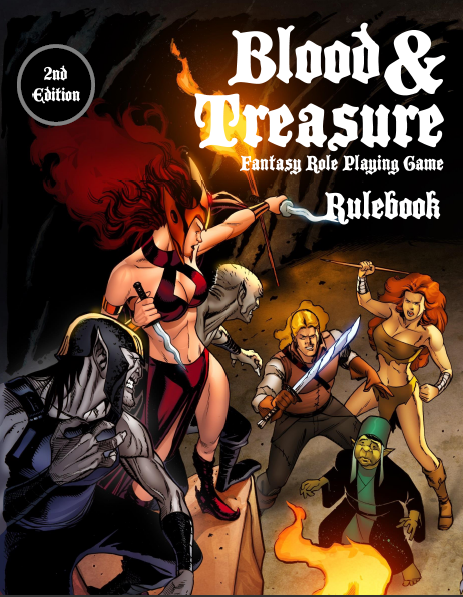 Blood and Treasure 2nd Edition Rulebook is Released! Just a quick one today, boys and girls – the Blood & Treasure 2nd Edition Rulebook is up for sale as a PDF on RPGNow.com and Lulu.com. $9.99. I’ll get the hard cover and paperback version up ASAP – just need to get a review copy first. This is a combination of player’s book and referee’s book, with all the classes, races, spells, rules, magic items and info on making dungeons, wilderness, settlements and other planes. The monsters will be in a second book called, appropriately I think, Blood & Treasure 2nd Edition Monsters. I’m shooting for getting that one up for sale in 1 or 2 weeks – there’s some editing to do, and I want to include some mini-dungeons as well. Blood & Treasure is the fantasy role-playing game for people who want to spend less time arguing over rules and more time playing, and the new 2nd Edition continues this tradition. Compatible with old school games, it strives to be rules lite and options heavy. Blood & Treasure 2nd Edition is designed to give you years of enjoyment in just two volumes, this book and the forthcoming Blood & Treasure 2nd Edition Monster book, which features over 600 monsters to challenge players. Once the Monster book is finished, I’ll jump into updating the NOD Companion, which will be retitled Esoterica Exhumed (and have a few new bits as well) and the Monster Tome, which will be retitled Monsters II. After that, whew – I’ll rest. Then I’ll get busy on finishing up the next issue of NOD and writing some shorter books and some blog posts. Purchased! LOVE it…a substantive update to an already-excellent OSR RPG. Can't wait for the next two books. Just picked it up! I'm curious, why did you decide to forgo the special abilities of magic items (such as holy, bane, etc?) Or did you just roll most of those into new items? Which are the main differences with 1st edition B&T? I did it to streamline the treasure system and magic items, keep the tables smaller and simpler – essentially to use a scheme more in keeping with old school games than new school. Many of those abilities were turned into specific magic items. Stay tuned – I'm going to do my next post on those changes – wanted to keep this one relatively short and sweet. If you think on it, only 3e D&D did the special abilities thing (maybe 4 too, but I never played it). 5th edition went back to the classic way as well. Regardless, looking forward to the monsters – I hope you've added some new ones as well! I just received my copy of the hard cover yesterday. Everything looks great. I really appreciate your efforts. Great – glad to hear it. I just got my hardcovers of the two books. Very nice work here. The covers are fantastic and your work in these books was a job well done.